This is a book that I did not want to write. Several years back, I wrote a novel about the threat to our national infrastructure from an EMP (electromagnetic pulse) attack. One Second After was published by Tor/Forge, and became a New York Times bestseller. I never anticipated its impact and what some now claim: its leading role in the creation of the so-called “prepper movement.” After that, and far more pleasurable in the writing, was my next work, Pillar to the Sky, a novel about a positive future which we can fashion with a renewed support of our space program. Both books were challenging in different ways, but never hit to such a visceral level as this book now does. 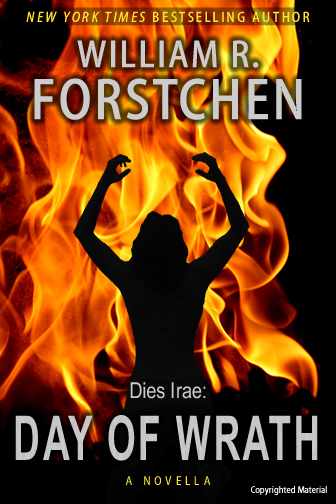 Only weeks before this ebook, Day of Wrath, hits publication, the murderous forces of ISIS swept into northern Iraq and unleashed a reign of terror that this historian sees as a campaign that makes Hitler's and Stalin’s fanatical followers look like amateurs. I am an historian of warfare; I often describe my job as similar to that of an oncologist. I study that which kills and hope that one day humanity will find a cure. When one matures from being a young man to middle aged, and suddenly the scourge of war is no longer something that you will bear personally on the battlefield, but instead will be borne by your children, by young students in your classroom whom you come to love, the fear of it strikes far deeper and is far more poignant. A few months back during a Saturday afternoon discussion with two who are very dear to my heart, the twin topics of ISIS with its barbaric outrages and the security crisis on our southern border came up. By the end of that conversation, both challenged me to write what became this book. Osama bin Laden made clear his intentions for us long before 9/11. Hitler made clear his intentions to all whom he declared were “racial inferiors.” The list of warnings from such hideous murderers goes back to the first pages of recorded history. Those who did not listen to such warnings eventually learned of their folly. Are we doing the same today? ISIS, or whatever it now calls itself as this book is released, has made clear its intent: our deaths and that of our friends and allies in Europe and Israel. Beyond that, the deaths of all who do not adhere to their interpretation of the Koran, including fellow Sunni Moslems who they view as “weak in their faith,” and Shi’ites. What is clear regarding ISIS and others like them: Their intent is to convert the world, both “Muslim” and “Infidel,” and if we are not willing to convert, then we must die. Second, and it surprises me that Western feminists are not more attuned and reactive to this issue, women are subservient on earth and are nothing more than objects of sexual fulfillment for martyred jihadists in their paradise. To say otherwise is to mislead, which their interpretation of the Koran states is acceptable. To mislead and lie to the infidel is acceptable until dominance over the “infidel” is achieved, at which point all must submit, convert, or die. There is a subtext within these pages that transcends ISIS; I’ll leave that for you to find. Recall the words of a politician who declared that any crisis presents political opportunity as well. You can accept my concern about ISIS alone, or with this other concern; at least in what is still a free Republic, that is something for you to decide. One can find evidence of just how evil ISIS truly is in very little time. Turn off your television and its reality shows. Go and face a true reality. Run a few internet searches of what ISIS, and those like it, truly is. The information can easily be found for, unlike the Nazis and the NKVD of Stalin, this cult does not hide its crimes. They gleefully post videos on a regular basis of their torturing, beheading, crucifying and executing thousands. Look evil in the eye and have the stomach and courage to stare back and say “no more.” To become aware, no matter how disturbing that reality is, is the first step to the resistance that we must be prepared to make in response. The final decision is in doubt. We can continue to sleep, to not face reality, to cave into the "liberality" of political correctness that preaches tolerance (even for cults of hate), or we can openly call evil for what it is and stand against it. There was a time when we did not hesitate to say that some things were indeed evil. Why do we fear to do so now? In closing: The opinion I voice here is my own, not that of friends, of colleagues, or of the college where I am privileged to teach. I hated writing this book. I had looked forward to a relaxing summer after working on a morally uplifting book about the promise of our space program. I did not want to write this one, but, as I expressed to friends, I feared that if I did not write it, and this nightmare happened, which it surely can, I would be responsible in some way for remaining silent. If you read on from here, it will not be an enjoyable experience. I hope that it will make enough of us think things through to ensure not only the safety of our children, but of our Republic as well. And, as always with such works that speculate a dark future, I hope that awareness will bring preparedness and thus the nightmare never happens. If so, the effort will have been worth it.